Last year I designed the Squarespace website for Tess at Minted Interiors. Since the website design and the birth of her third child (!!!) she has found time to hire a branding specialist to create a new logo and brand for her business. To switch up her website to take in the new brand of navy & brass and her chosen feature font Brown, it took less than 20 minutes in the backend of the site, even though Brown is not on the extensive font list, I was able to add it for some headings with a little CSS help. Minted Interior's old brand was a light mint and circle logo and used Josefin font. Mint and Grey were prominent through the website. Next was to go to the styling and change up the colours so they reflected the new navy & brass branding. Firstly I found colours that matched the logo and was close enough to the brass (hard to choose one colour for the brass which was more mottled). Go HERE to find a handy tool where you can load an image and then pick the colours from the image to get the HEX colour code to load into your website. By going to Design>Style Editor all the colours used in the website can be changed. As you can see we changed most of the heading colours to navy, switched up the hover/active navigation colour to the brass colour chosen and changed the text colour to a deeper grey just to take away from the soft grey of the previous brand. As Tess utilised buttons on her website, these also needed to be changed to her stunning new navy brand. 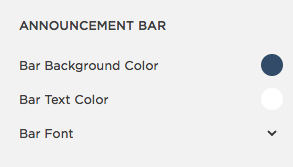 I also changed the announcement bar incase she ever wanted to use this option. The final change was to start looking at the fonts. Because I didn't want Tess to have to use CSS every time she wanted to add text to her website, the main font was chosen to be Helvetica Neue. So for each heading and body text we changed the Josefin font to Helvetica Neue. I did want to feature her brand font Brown so did a little CSS fix for Tess for the logo subtitle and navigation font so that the logo, subtitle and navigation bar works in unison together. This was done by first loading the font into the website. Going to Design>Custom CSS and scrolling to the bottom, then clicking on the Manage Custom Files button. This allows you to upload the font file which can then be accessed when coding. I have to say the final product is very sophisticated and reflects Tess's growing business. Don't forget to visit the live site for the full experience.